Starmobile enters the entry-level smartphone market with its newly released Starmobile HIT. This Android 2.3.6 (Gingerbread)-powered smartphone will also sport a mobile TV feature - something that most of its competitors don't have! 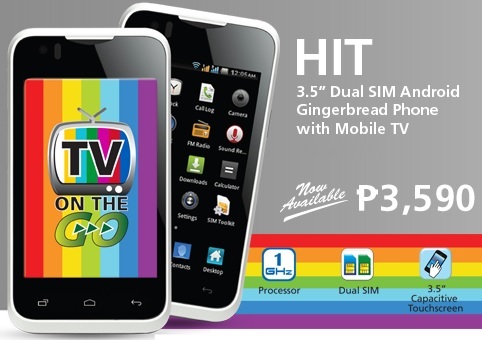 Likewise, this handset is only priced at Php 3,590. Considering that it is powered with a capable 1GHz CPU and framed at 3.5 inch makes it a good catch. Other essential internals include a 256MB of RAM, 512MB of internal memory (up to 32GB micro SD support), a 3MP rear shooter and a VGA front shooter. As of this writing, this is the most affordable Android phone with mobile TV. So it's safe to say that its 3.5-inch screen will boost up your TV experience on the road. It'll be out this month. In the meantime, you could "hit" the rest of Starmobile HIT specs after the break.